Meet the best ever professional Service Script that provides multi services indeed to one personal use. If you are ready to start a website that meets appropriate growth in professional platform to recruit everyday needs, our On Demand Marketplace Script highly helpful for you. We are the leading website design and Development Company providing B2B solution at minimal cost, professional Service Script comprises of three simple grouping such as service seekers, service providers, and marketplace owner. A commission pay will be get by website owners since work provide by task providers. Service seekers are able to post their quote to job portal with free and pay process. Our Online Services Marketplace Script list all local services as well to afford effortless services to the entrepreneurs. 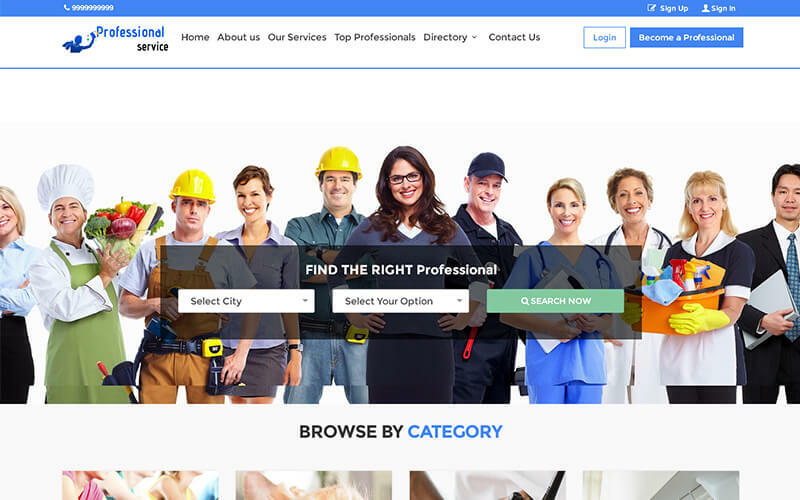 Service seeker destination ends up with our professional service script for all kinds of services such as Electrician, Carpenter, and Mechanic etc. Our Online Service Booking Script is developed by high-level security Php MySQL database and it supports unlimited database as well as the users. The end user can search accordingly to their interest in the work space. Also, any user will able to post their office, rentals or work space if they have availability. I would like happily inform that if you buy this script within the next 24 hours. Basic and Advanced Search options, Professionals list with clear details, Top Professionals, Professionals Booking, Appointments management, Location Management, Category Management, Professionals Management, Review Management, Ad Management, User Feedback Management. It’s pleasant to use this marketplace script. Based on my customization they met all needed requirements. Since I bought this script, I didn’t face any issues. Superb concept and its works amazingly. They solved my doubts and issues politely and good work from this team. Thank you phpscriptsmall team. I have searched for marketplace script in various companies. Later I found a great script from this company. I had pleasant experience and am happy with this script.